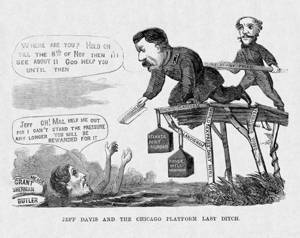 In this Funniest of Awl cartoon, the Democratic national ticket of presidential nominee George B. McClellan (front) and vice-presidential nominee George Pendleton (back) stand atop the rickety “Chicago Platform” and attempt to assist Jefferson Davis, who is sinking in the deep waters of the Civil War. The Confederate president offers to reward McClellan, but the Union general replies that Davis will have to wait until after the presidential election on November 8. Pendleton, a Peace Democrat and congressman from Ohio, approaches with a “Peace At Any Price” plank. From the weeds of “Slavery” and “Treason,” a copperhead snake (symbolizing Confederate sympathy) slithers toward the platform.